Lean Machine Now Cuts Metal Even Faster — Lean Machine Metal Fabrication Inc. Lean Machine adds another super-accurate machine to its arsenal. HanKwang's laser-cutting machine makes quick work of profile cutting. Stainless steel up to 5/8-inch (16-mm) thick and steel up to 1-inch (25.4-mm) thick are cut within a .001-inch (.025-mm) tolerance. The machine can even handle aluminum up to 3/8-inch (9.5-mm) thick. The laser cutter means that almost all projects can be completed in house because in addition to the laser cutter we still offer full fabricating and machining services. This means a quicker turn around for customers since there is no time wasted waiting for outsourced parts to come in to complete assemblies. 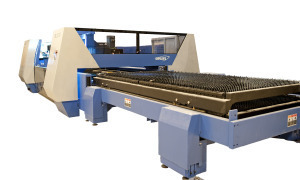 This laser-cutting machine is one of the fastest and cleanest ways to cut steel, so it fits very well into the rest of Lean Machine's production.